As a club meeting is generally held in the club itself, the agenda just needs to contain the date and time of the meeting. The key components of the subject being discussed must be mentioned. Questions on matters unrelated to the meeting can be scheduled for the next meeting of the club. 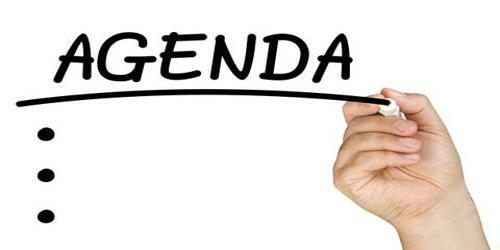 A club meeting agenda can be displayed on the noticeboard of the club where it becomes viewable for the members conveniently. Call to Order issued by the chairman of the president of the club to commence the meeting. The singing of the national anthem and a pledge to the flag. Introduction of new members and visitors. Minutes — the secretary of the club reads the minutes of the previous meeting and after that continues making notes of the present meeting as a record for the minutes. Officers reports — officers of the club including the president, vice president, secretary, and treasurer present reports of the club during the meeting. Pending business — the president of individual club committees present items discussed at the previous meeting that need to be discussed further. New business — the president presents the topics for discussion. Committee reports — the chairman of every club committee informs the club of the activities the committee has been involved in. Club program — special invitees may be called to speak about a topic of interest. Announcements — the president or club members may share information with other members about forthcoming events and activities. Adjournment — the president moves to adjourn the meeting and close it. 1) Call to order by the president to commence the meeting. 2) Approval of the minutes of the previous meeting [minutes to be distributed in advance for the review asking for any objections to the meetings. If no objections are raised the minutes are considered as approved]. 3) The introduction of any guests. 4) Updates of forthcoming events as well as items of interest from any board members. 5) Discussion of any pending business. 6) Discussion of any fresh business.